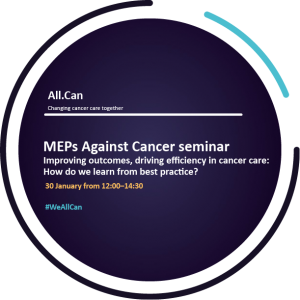 Improving outcomes, driving efficiency in cancer care: How do we learn from best practice? To address growing concerns over the efficiency and sustainability of cancer care, Lieve Wierinck MEP – together with All.Can, the Association of European Cancer Leagues (ECL), the European CanCer Organisation (ECCO) and the European Cancer Patient Coalition (ECPC) – hosted a seminar with the MEPs Against Cancer (MAC) group at the European Parliament on 30 January 2018. The seminar gathered over 50 representatives from a broad range of sectors. 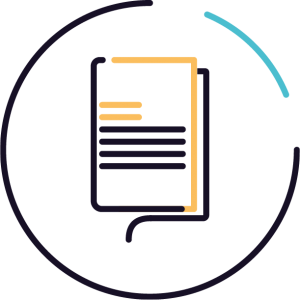 Stakeholders represented included: healthcare professionals, such as oncology specialist nurses and radiotherapy; patient advocacy groups; policymakers; and medical devices, digital health and pharmaceutical industry. This allowed for a multidisciplinary take on the issues under discussion. Ms Wierinck, a cancer survivor and strong advocate for better cancer care across Europe, passed a resolution on the European Semester in February 2017 to include measures aimed at improving efficiency in cancer care at the EU level. The seminar advanced this topic and focused on solutions that have been shown to improve efficiency across the entire care pathway – from small-scale efforts to system-wide changes – and encouraged policymakers to adopt such practices in their countries. 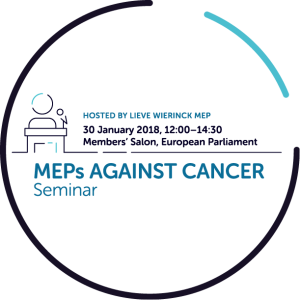 ECL President Dr Sakari Karjalainen introduced the work of the MAC group, which provides a platform for exchange of views with MEPs, other EU and national officials, experts, researchers and stakeholders in European cancer policy and cancer control. Croatian MEP Dubravka Šuica, a member of MAC and the European Parliament Committee on the Environment, Public Health and Food Safety (ENVI), was at the seminar to show her support. Dr Suzanne Wait, representing the All.Can Secretariat, outlined key issues facing policymakers. She highlighted the potential benefits of efficiency improvements – an estimated gain of two years’ life expectancy in Organisation for Economic Co-operation and Development (OECD) countries. Lydia Makaroff, Director of ECPC, showcased some powerful solutions to efficiency challenges, drawing from examples of best practice from different countries and across the cancer pathway (see presentation). She praised the work of Dutch Social Enterprise Jobs After Cancer, which supports cancer survivors who wish to return to work. The Netherlands is the first country with a governmental action plan to support cancer patients’ return to work. Ms Makaroff also highlighted ECPC’s work on the Patient Guide on Survivorship, in collaboration with the European Society for Medical Oncology (ESMO). Following the keynote addresses, the topic of efficiency in cancer was brought to a panel of experts. Dirk van den Steen of the European Commission’s health directorate (DG Santé) commented on existing disparities in cancer outcomes and inequalities in access to care across Europe. He noted the importance of presenting solutions to policymakers, rather than solely highlighting existing challenges. Dr Banks commented on the importance of listening to the patient perspective. He reiterated that this is the starting point for improving efficiency and outcomes. This was a clear consensus of the seminar. Amadou Diarra, Head of Global Policy, Advocacy and Government Affairs at Bristol-Myers Squibb, commented on the importance of industry’s involvement in multidisciplinary policy initiatives like All.Can, which help to identify and scale-up best practices globally to enable better outcomes for cancer patients across the world. Pascal Garel, Chief Executive of the European Hospital and Healthcare Federation (HOPE), spoke of the importance of changing attitudes and gathering evidence to inform the way care is provided. Only open attitudes and respect for data can persuade individuals to promote real change in healthcare systems. The outcomes of the seminar have been published in the World Cancer Day edition of The Parliament Magazine. We have launched the All.Can patient survey on waste and inefficiency in cancer care. Opportunities will be sought to share findings from the survey with MEPs and the European Commission. The ICHOM–All.Can Value in Cancer Care project is calling for cancer centres to participate; see the call for applications. Join us at the ECCO summit in Vienna from 7–9 September 2018, where there will be a session on improving efficiency in cancer care; see the preliminary programme. Learn more about the work of All.Can by watching our animation and reading our annual report. To find out whether your country has a national All.Can initiative, more information can be found on our All.Can around the world page. If you are interested in finding out more about All.Can’s activities, you can find us on Twitter and Facebook, or email secretariat@all-can.org.